Our Stage 1 kit featuring a cold-air intake kit and performance software. The aFE intake is made from high-quality materials, reducing underhood temperatures and not contributing to heat soak of the air filter. aFe's Stage 2 Intake uses an oiled cotton air filter for maximum air flow and excellent filtration. The kit is supplied complete with heat shield, ABS plastic intake tube, sealing materials, hardware, and install instructions. 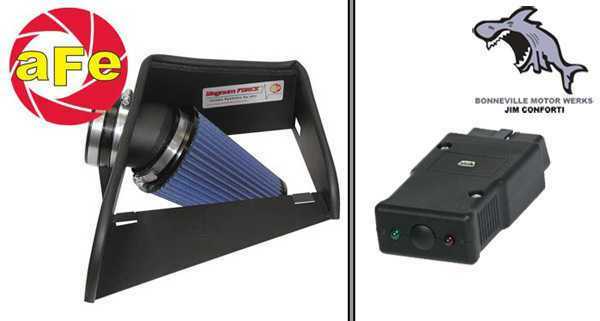 Both of these items work together to bring up huge torque increases and much improved driveability. They provide a solid performance boost with a low upfront cost. For an excellent 'bang for the buck' upgrade, the software and intake are a great choice.